Organic sheets, towels, blankets and rugs can often be out of your budget, but not anymore. 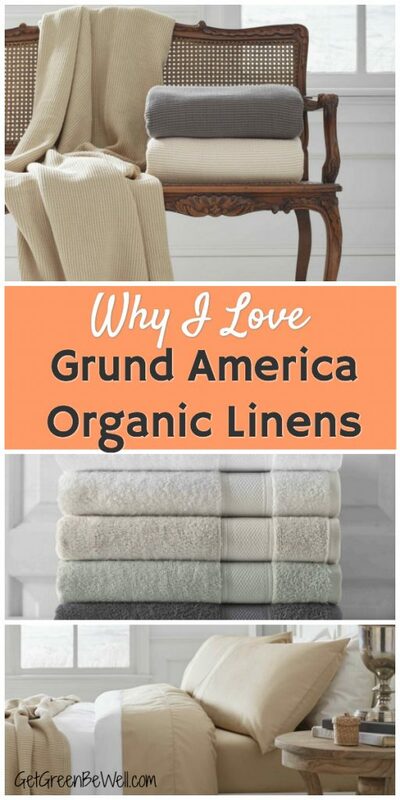 Grund America offers sustainable, organic bath and bed products that are affordable and perfect for a modern, natural home. I absolutely love finding the best buys for an organic and natural home. It actually makes me giddy when I find a great company with values to protect both workers and the environment. But I’m not aware of every company out there, especially if they don’t have a strong American retail presence, yet. Which is why I’m so happy that Grund America reached out to me to try some of their products. I might not have found them otherwise, but now that I’ve done my research, I know it’s a company that you will want to support, too. I hadn’t heard of Grund before. I’m guessing you probably haven’t either. But here’s why you’ll be happy you’ve discovered the sustainable company. 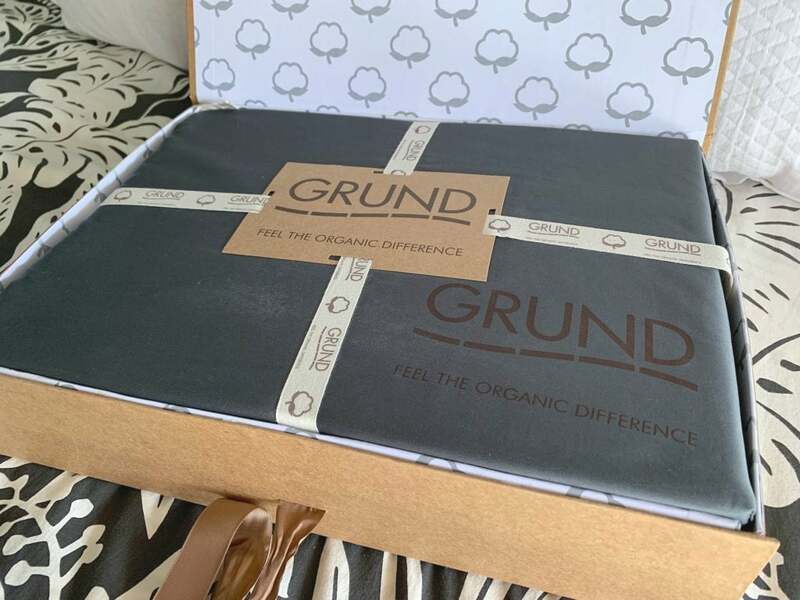 Grund is a company that first got its start in Europe. After the fall of communism in Czechoslovakia, Mrs. Grund read that the country was desperately lacking bathroom rugs. 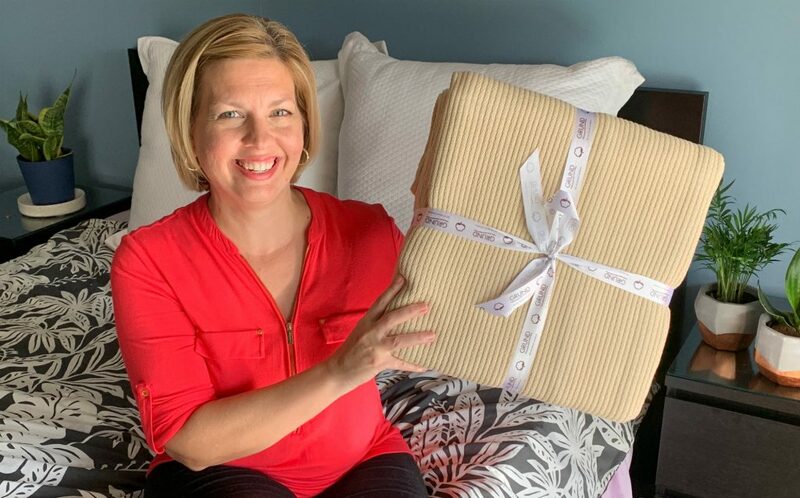 She and her husband wanted to start a business to help others for the better. And being entrepreneurs, they wanted an industry where they could succeed, too. So making bathroom rugs was their first endeavor. 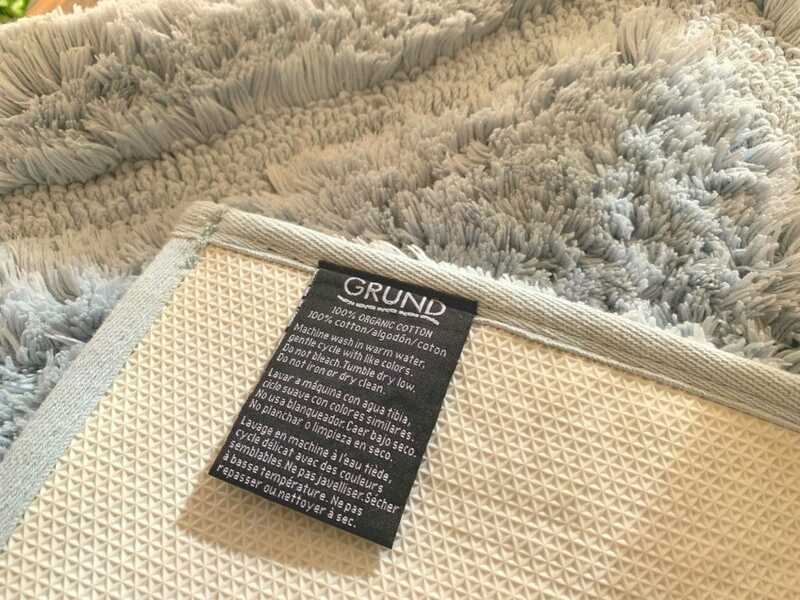 Soon, their sustainable bathroom rugs were just one of the products that Grund was producing with the environment and workers in mind. Bed Sheets, organic towels, organic throw blanket and organic robes would soon join the list of products made by workers treated fairly around the world so that they can better their lives. The socially responsible family company has the driving goal of improving the lives of others and being a part of positive change for workers. This is the product that started Grund as a sustainable bath and bed company. Grund has sold over 30 million rugs around the world! I love the varieties of organic bath rugs that are available. And being from the Southeast, I love that two of the bath rugs are named after beloved Southern cities: Asheville and Charleston. 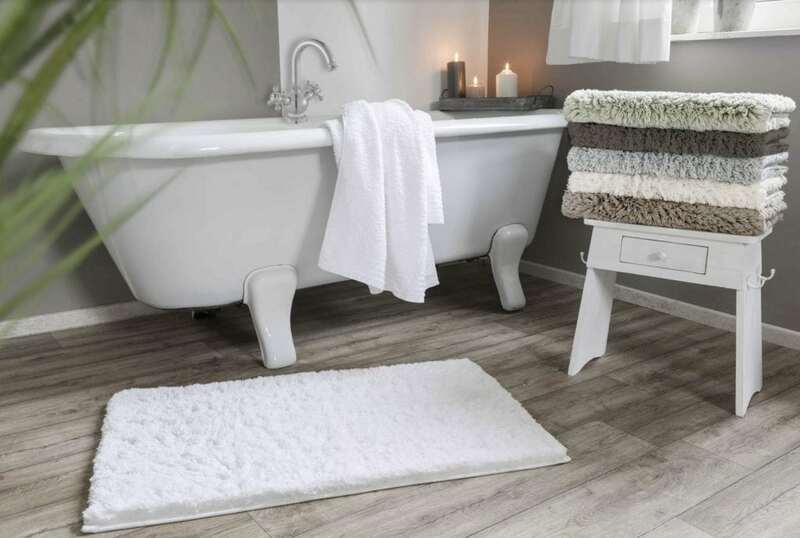 Reversible bath rugs have the plush organic cotton on both sides. You will be able to flip over the rug to get two uses from it before laundering. 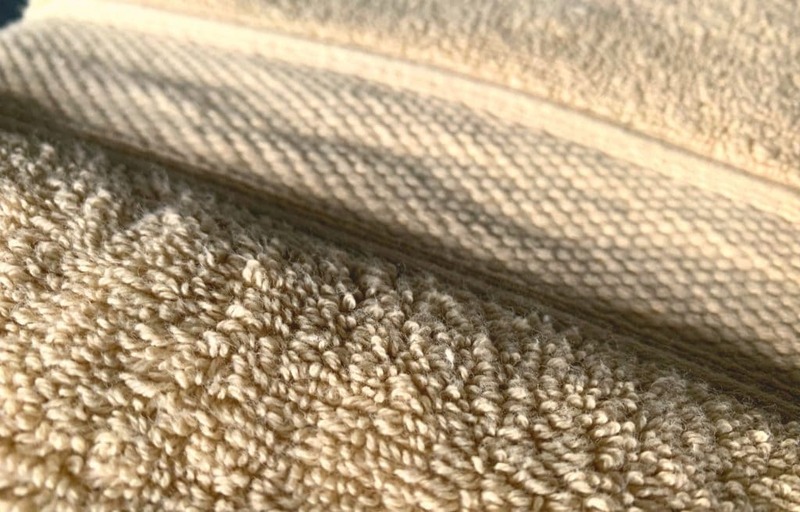 Non Skid Bath Rugs have a heavy duty non skid bottom that is certified by the National Floor Safety Institute. I am really impressed with the affordability, style and colors of the Grund America rugs. The substantial rugs have a thick and high pile which is just want you want to dig your toes into when you come out of the shower or tub. The Asheville Non Skid Organic Cotton Bath Rug in Denim Blue, which I tried out, is beautiful. Denim Blue is just one of six colors. I like the simple design and classic appeal. And I appreciate the fact that the bath rugs come in a variety of sizes. Sometimes you have a bathroom or small space that just requires something a little bigger or smaller than traditional sizes. Grund America Rugs can fit your specific requirements. Your bath towels touch every single part of your body. Every part. Yes, think about it. That’s why organic bath towels are so important. 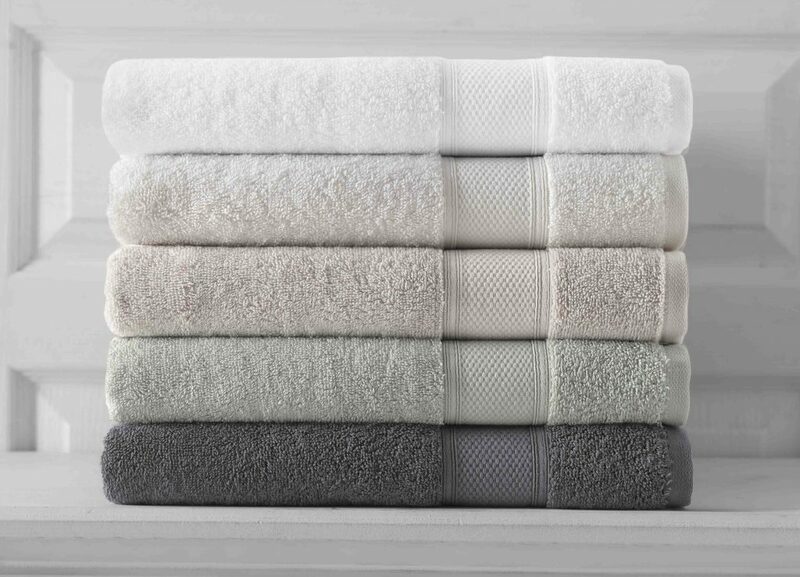 Choosing organic towels means that the fibers haven’t been treated with pesticides while growing. It also means that the fibers haven’t been treated with unnatural chemical finishes or coatings after the towels have been made, either. Sometimes, conventional towels are coated with finishes such as permanent press, color locking or wrinkle resistant finishes. All of these contain chemicals. And you don’t really need any of those ingredients touching your most sensitive skin. 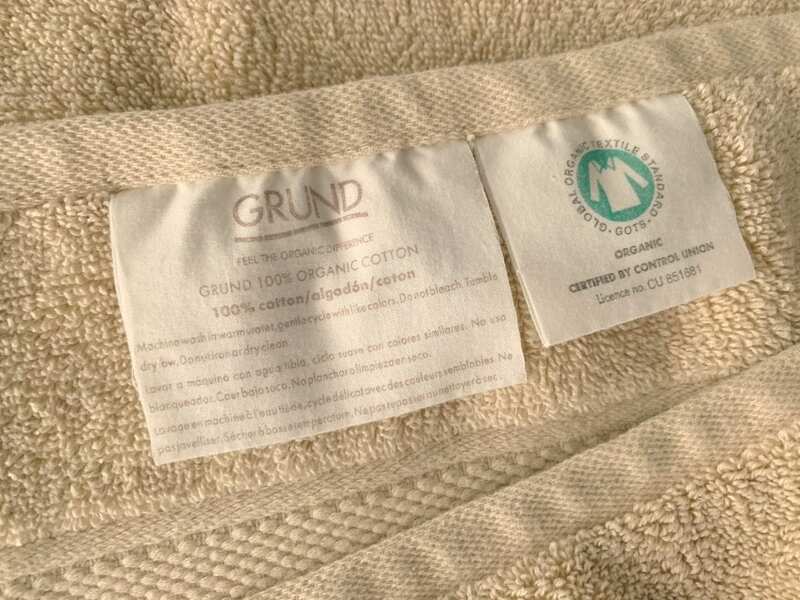 From the moment that I touched the Grund Organic Cotton Towels, I could feel how soft they were. And that was before I even put them in a washing machine! Grund 100% Organic Cotton Bath Towels use 100% GOTS Certified Turkish Organic Cotton. And they come with a remarkable 5 year warranty. I tried out a 2 pack of the Grund 100% Organic Cotton Bath Towels in the Driftwood Color. The soft muted brown color is a perfect neutral to add to your decor. Additional colors include Ivory, Slate Gray, Sage and White. The towels were supremely soft and well packaged when I received them in the mail. After washing, the softness did not fade. I found the towels to be absorbent, plush and a great size at 30 X 54 inches. The organic cotton towels are sold in two packs, bath sets and individual bath sheets. Organic sheets are one of the best ways to get a good night’s sleep without toxins. Many sheets are made with lots of unnatural materials or chemical finishes. For instance, polyester sheets are made with synthetic material. Plus, polyester doesn’t let your skin breathe and regulate temperature as well as natural materials. So you can end up waking up too hot in the middle of the night or sweaty. 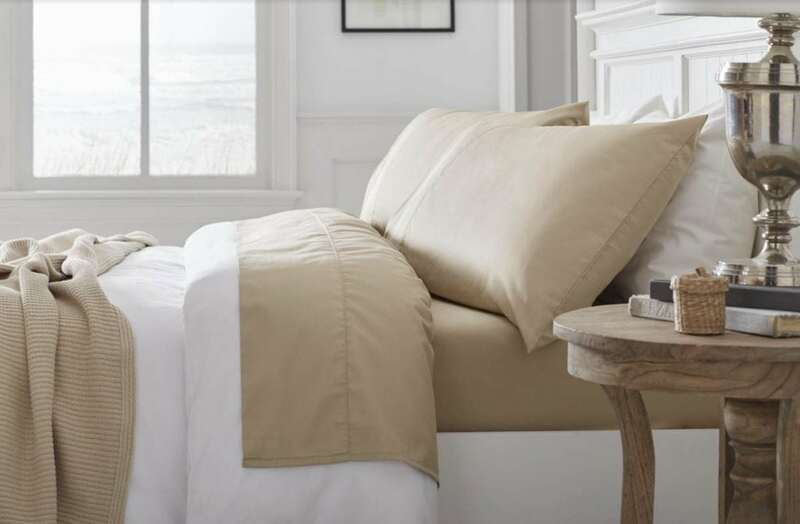 Conventional sheets are often treated with wrinkle resistant finishes. The trade-off of having no wrinkles on the sheets is that you might be sleeping on fabric treated with a formaldehyde finish. I’ve even seen sheets that are treated to be resistant to stains from benzoyl peroxide found in acne medications. With a finish like that, I would hate to know what chemicals are being used to prevent staining. 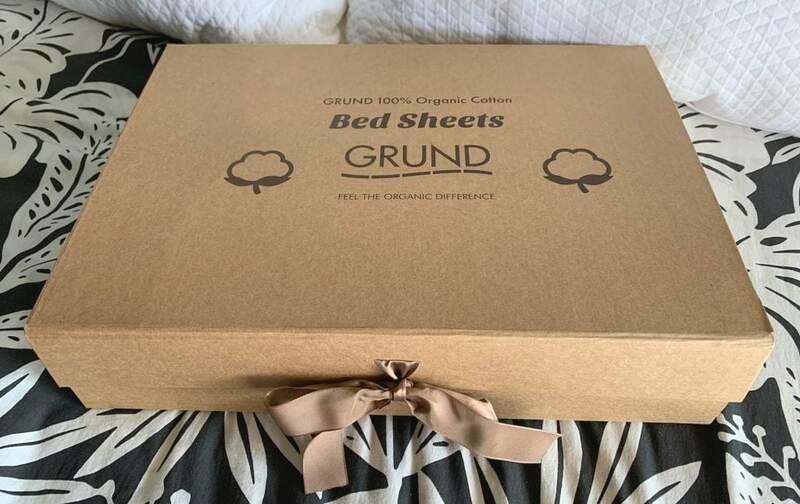 I was impressed by Grund’s Organic Bed Sheets from the moment I saw the packaging. The presentation is beautiful! 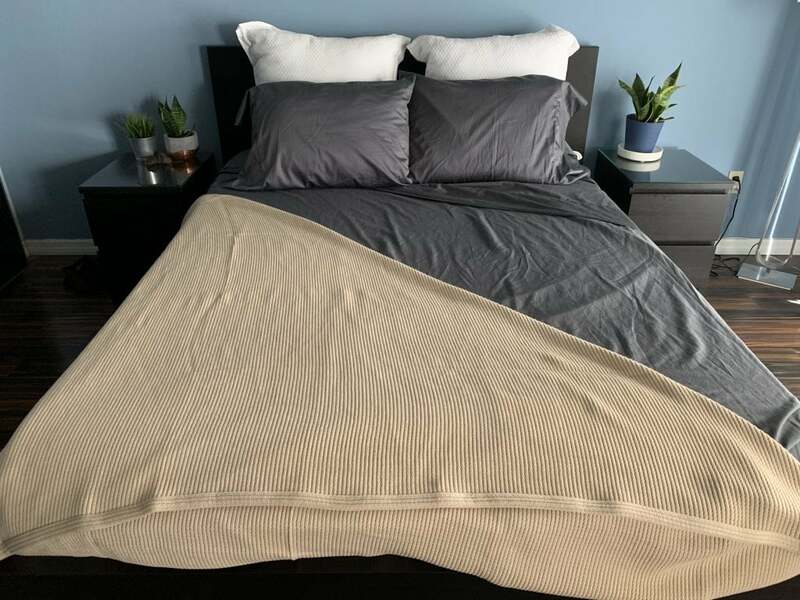 We chose organic queen sheets in Slate Grey. Usually I choose white sheets or light colored. But this color of dark grey was so pretty online, that I had to try it to break out of our mold. And it’s beautiful! Not too black, just enough shine and sheen to make it modern and chic. We love the color, but we also love the feel of the organic cotton. After just one wash, the sheets certainly feel soft and comfy. I think they’ll become softer over time with lots of washings, which I don’t mind at all. The organic bed sheets have deep enough pockets and a large enough top sheet to accommodate the bigger size beds. We don’t have a huge mattress and there is ample overage of the fabric hanging off of the side. So if you had a very thick or oversized mattress, I think you’d be happy with the coverage of these organic sheets. If you’re going to add organic cotton sheets to your bed, be sure to finish off your natural bed with an organic cotton blanket, too. I have to admit, I have spent too many nights freezing on the couch trying to cuddle up under throw pillows just to stay warm. 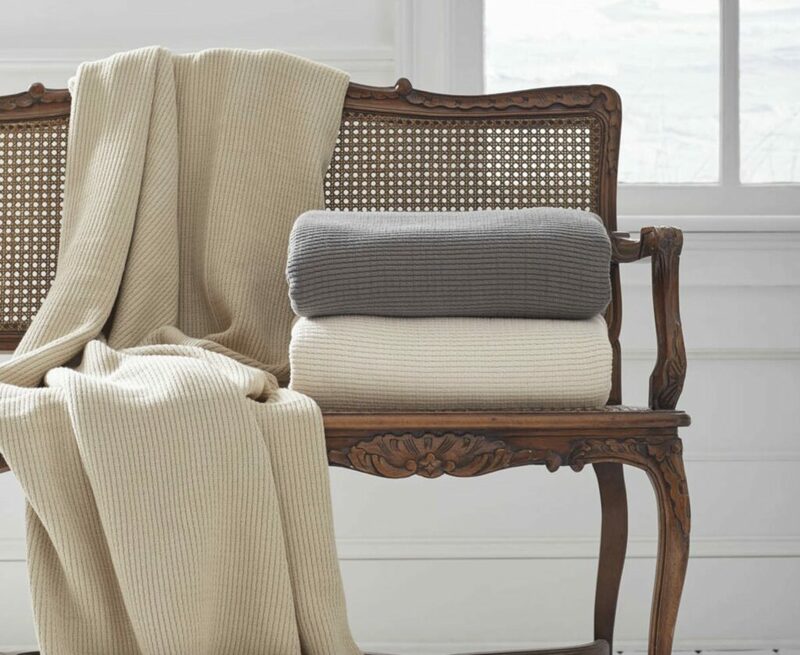 So when I discovered Grund’s Organic Cotton Throw Blanket, I instantly had visions of movie nights cuddled under an organic throw blanket watching Netflix. And I am not disappointed! When we unwrapped the ribbon around the organic throw blanket, I was instantly surprised at how thick the organic blanket was. 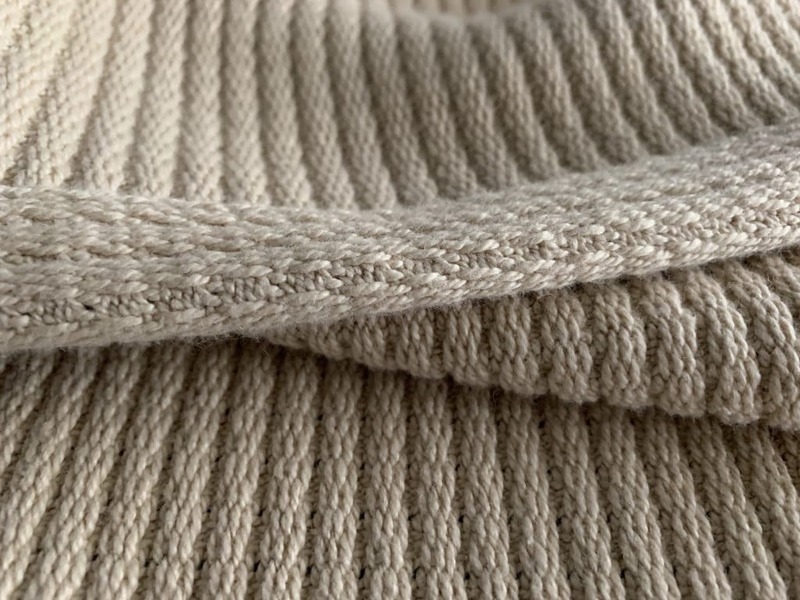 The substantial knit is still soft and cozy. It’s perfect for an organic throw blanket or an organic blanket for your bed. We tried out the color of Driftwood. I figured it was a nice neutral with a beachy vibe that wouldn’t show dirt if it wasn’t washed too often. The natural color is created without any bleach or toxic dyes. 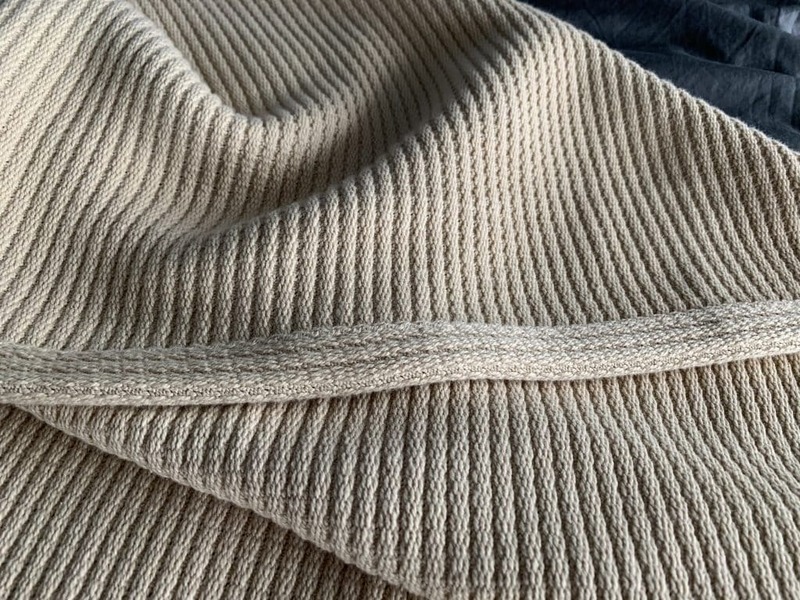 Made with 100% GOTS Certified Organic Cotton, this is a great organic throw blanket for the living room, the bedroom, or sitting outside on the porch. A smaller size (50 X 70) is also available. It’s so important to have nontoxic, chemical-free bedding to sleep on every night. But it’s not the only thing that you should do to create a healthy bedroom. Be sure to reduce EMFS in your bedroom for optimal sleep. It’s actually easier than you might think. Choose an organic mattress. Here are some ways to afford a nontoxic bed. If you can’t afford an organic or all natural mattress right now, here are some ways to make your bed more comfortable for cheap. Changing your bedroom decor can also result in better sleep for you. Try out these tips on how to darken your bedroom for better sleep, how to declutter your bedroom for better sleep and the best bedroom plants to remove toxins.